So what is it about moving that can create stress in your dog? Well, for one, reading dog body language can tell you a lot about how they’re feeling. A tense body, a stiff tail, ears that are pulled back, and intense staring are just some signs of a dog who feels threatened or anxious. Depending on how long you’ve had your dog and how closely bonded you are, you may want to keep your distance. For example, if you’ve had a shelter dog for a year or two who had bad experiences with their previous owners, don’t step in and try to cuddle them when they show you body language like this. You are not familiar enough with their personality and what triggers them yet. On the other hand, if you’ve had your dog since it was a pup, you can sensibly feel more confident about snuggling your dog when they appear to be anxious or stressed. There are some cultural myths pertaining to dog stress and behaviour, including the idea that there are aggressive breeds. This isn’t true. 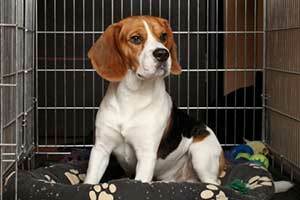 A dog, no matter what breed, simply learns certain types of behaviour from its experiences. The idea of driving for hours on end with a pet who needs attention every other hour is stressful enough. It can be even worse if you have more than one pet and they don’t get along. Snarling going on in the backseat while you’re trying to listen to your GPS will make anyone go haywire. Flying with your pet is an overwhelming prospect at first, particularly because a lot of airlines make your cat or dog travel along with the luggage. This can be very worrying for the pet owner, who sits looking below their feet for the entire flight wondering if their animal is okay. Luckily, most airlines will kindly offer to check on your pet during the flight (particularly if it’s longer than three or four hours). If you board the plane and the air hostess doesn’t offer, chances are they’ve either forgotten or aren’t familiar with your situation. If this happens, all you have to do is make them aware that your dog is on the flight and they’ll put your mind at ease. 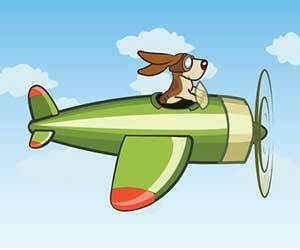 If you do decide to fly to your new home, there are a number of tips for flying with your pet you should consider. The more research and preparation you do the better. Read up about the type of cage your pet should go in, the rules of the airport you’re flying into, and any vaccination requirements. The specifics of your flying experience depends largely on you. For example, there is a lot more effort that goes into flying a doberman rottweiler from France than there is a kitten from the next state. As a general rule, if you live in America and are simply moving to a different state, you won’t have to have too much work done on your pet at the vet. Most of the organization will revolve around getting your cat or dog a cage, getting them used to it, filing documentation correctly, and paying for the flight of both you and your pet. If you are going to be making use of a cage for your animal, it is imperative that you order and purchase it much earlier than you need it. Do not leave this step until the last minute, because your pet will quite simply refuse to go into the cage. You will have enough stress to deal with that comes from the general process of moving, so make sure your cage arrives to your old home at least a month before you’re scheduled to travel. You’re not going to need a cage for driving to your new home, so it mostly applies to flying. When the cage arrives, you need to train your pet to see it as a nice comfortable bed instead of a scary metal contraption. How on earth do you achieve this? Well, first of all, you leave the cage sitting innocently with the door lying open. Watch your pet carefully. It will sniff around it and eventually venture a paw inside. The key to this process is patience, because it’s very slow and gradual. It could take a week before your pet has all four paws in. Sure, you can try to coax it in with treats, but unless your pet had a knock to the head when it was a puppy it won’t fall for it. Treats do work in another way, however. You can try training it to go into the cage and reward it with a treat. This is much different to simply trying to bribe your pet. They generally won’t fall for a transparent bribe, but they love you and genuinely want to please you. Thus, if you show them in a clear and consistent manner that you need them to go inside the cage in order to please you, they will do so. The treat helps too, of course! Congratulations for arriving at this part of your journey. You can now breathe a huge sigh of relief and pat yourself on the back for getting through it. Settling into your new home with your pet is a lot easier than travelling to it. Dogs are loyal to their owners, and unless they have a particularly nervous temperament, they are excited to see and experience new places with their human friend. Worse case scenario, your dog may actually get a bit too excited and territorial peeing may occur for the first week or two. This is their way of marking their space when they’ve arrived in a new environment, so it’s perfectly normal behavior. Hopefully you haven’t kitted out the new home with beige carpets! Northern Virginia is a great place to relocate to if you are a pet lover. Did you know that there are a number of pet-friendly places to live here? 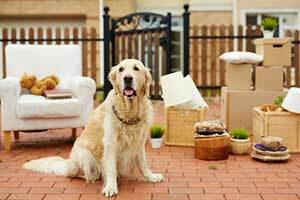 If you’ve just signed your rental contract you’ll have to stick it out for a year (or however long the contract is for) but if you’re just considering moving here, you should check out the best pet-friendly places to live in Northern Virginia. The last thing anyone wants is a landlord stressing them out about unrealistic rules regarding their pet.